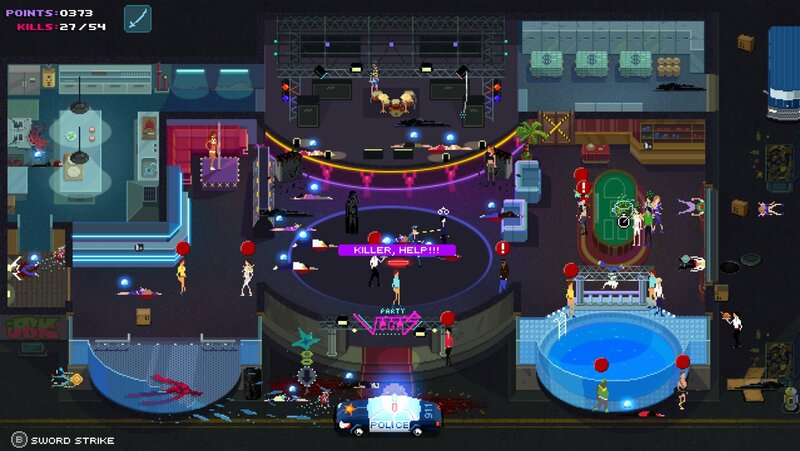 At first glance, Party Hard seems simple enough; but scratch below the surface and there was clearly plenty done by developer Pinokl Games to help keep things fresh, even long after finishing the core story. You wouldn’t know by playing it, but Pinokl Games, based out in Ukraine, spend most of their time making family-friendly games. It wasn’t until their crazy little Game Jam slasher was noticed by tinyBuild—famous for developing and self-publishing No Time to Explain—that they set about developing this hilarious murderfest in earnest. Something I realized while playing Party Hard is that it’s all about the details. After all, earlier this year, Hatred launched to the scorn of many, yet it features a protagonist who’s fed up with the world that decides to kill his way to a better tomorrow. Party Hard features a protagonist that’s fed up with the world that decides to kill his way to a better tomorrow—but it also features excellent pixel graphics, fantastically catchy music, and incredibly entertaining mechanics. This is a game that’s definitely greater than the sum of its parts. I love the attention to detail on the part of Pinokl, here; little things like how each different party scene relays a unique story, even via the backgrounds. The game randomly generates the details to each level on each individual attempt. So reloading a party might mean that there’s now a horse in the living room (which can be spooked into kicking anyone behind it) and an easily poisoned punch bowl is now absent. Party Hard isn’t without fault; there are a couple minor oversights in the translations, and the voice acting in the cutscenes that tell the story are both awful and predictable, but that sort of lends to the charm. The game is intentionally loaded with tropes from classic slasher flicks, and it’s hard not to get swept up by them. Should I murder the two that just snuck into the bathroom for a quickie, or should I leave a corpse outside the door for them to discover on their way out? Certainly not a question I was expecting to ask myself when I first started playing. The game also features a fun little accusatory system whereby partygoers will frequently accuse anyone too close to a corpse of being the killer when it’s first discovered. This can lead to some highly amusing situations of eliminating hard-to-kill guests in very roundabout ways. It also means that it’s super easy to get yourself busted if you don’t find good enough hiding spots for yourself or the corpses you leave before someone stumbles upon them, but it’s systems like this that really allow Party Hard to shine. 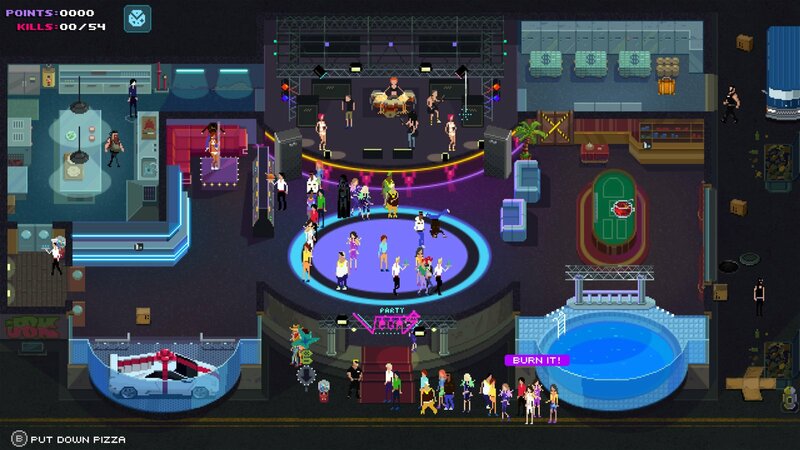 Party Hard is one of those rare games that manages to capture the very essence of exhilarating fun, and in truth, most of this is done by explaining as little as possible. There are so many mechanics in the game that I don’t fully understand, even after completing the core story. Contrary to what many might think, this is actually a great thing; as your rampage unfolds and, inevitably, goes sideways, it’s the outcomes that you didn’t intend that will frequently make for more laughs than the ones you did. See, Party Hard never takes itself too seriously, and that’s what sets it apart from a game like Hatred. It’s not about appealing to angsty kids who are fed-up, it’s about appealing to players’ sense of whimsy while pandering to classic slasher fans—and I love it. I love the stupid story that I pinned from the third of the twelve core missions. I love that there’s a black bear in a bowtie that can show up and maul guests. I love that the pro(an)tagonist shares a pixelated likeness to Richard Ramirez. And I especially love that there’s a button to just dance like an idiot while creeping out the partygoers around you. 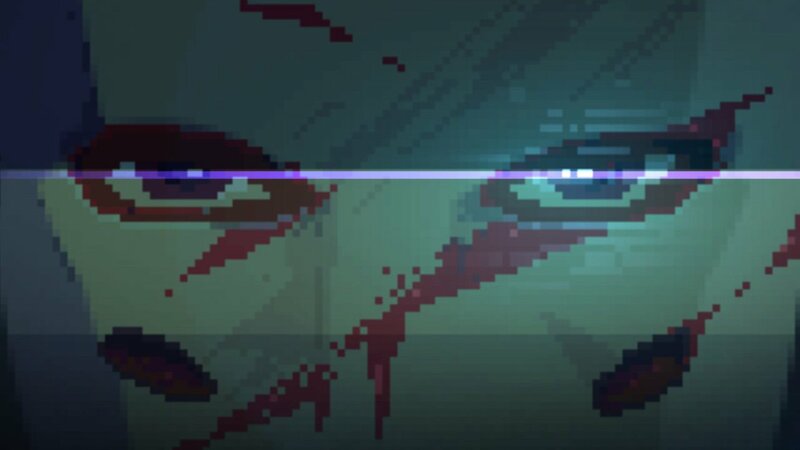 Party Hard isn’t a game that attempts to explain everything; it simply doesn’t need to. It makes no excuses for what it is. Like so many of the iconic NES games I grew up with, the only “because” the game offers up is, “because it’s fun”. Party Hard isn’t without fault; there are a couple minor oversights in the translations, and the voice acting in the cutscenes that tell the story are both awful and predictable, but that sort of lends to the charm.